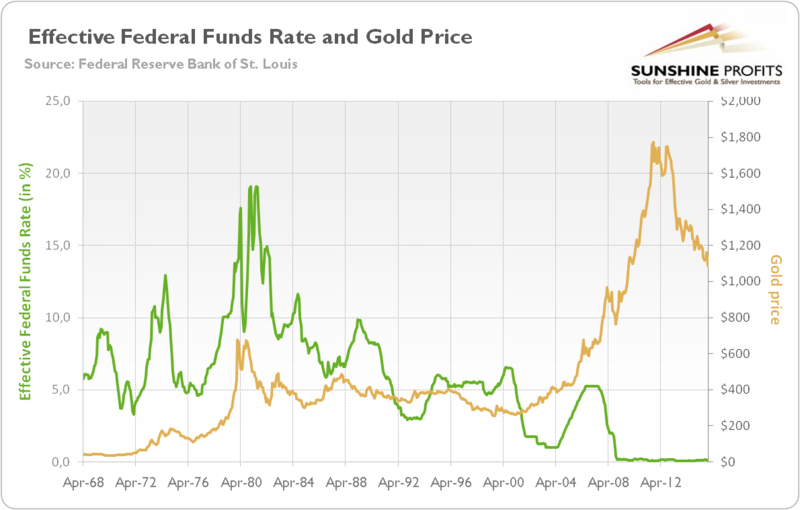 One of the most common relationship between interest rate and gold is that when interest rates go up, gold will go down. This is norm that is painted by the financial media, so much so, that it becomes ingrained in the minds of ordinary investors and traders. That was the reason why gold succumbed to heavy selling when the minutes of the FOMC meeting came out. Look at the period from 1972 to 1975. Interest rates moved up to approximately 13% while gold moved up in tandem. Then look again at the period from 1977 to 1981. Interest rates moved up to almost 19% and gold moved up to its highest price ever during the same period. Look again at the period from 2004 to 2007. Interest rates were up and so was gold. The last example was the recent December 2015 hike. Gold went into a bull market . So gold remains an excellent hedge in times of inflation and deflation. 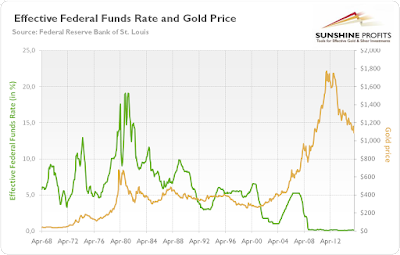 As for deflation just look at the price of gold when interest rates are near zero from 2008 onwards. Investors need to bear in mind that gold has also gone up rather rapidly in Q1 2016, so inevitably some correction will take place. This will impact the miners which have seen some recent gains being eroded by about 10%. However, look at the long picture. The world continues to print more money and global debt has skyrocketed. it certainly won’t end well unless you are invested in gold or silver and the related miners. The US has subprime auto and college loans, each exceeding US$1T in value. The energy sector is collapsing with increased bankruptcies. This will hurt the financial sector hard. Incidentally, the Gulf States in the Middle East are working on a Syariah compliant gold investment. According to Bloomberg, if this is finalised, it could unleash as much as US$2T investment into gold related products. Anything that benefit gold, will definitely benefit silver and the miners.